An orphaned Steller sea lion pup rescued in Washington state is transported to The Marine Mammal Center for care until he’s old enough to survive on his own. Leo the Steller sea lion is released near Ocean Shores, Washington. After five months of care—and more than 150 pounds gained!—at The Marine Mammal Center, Steller sea lion pup Leo finally returned to his ocean home. This orphaned pup got a second chance at life thanks to the collaborative efforts of marine mammal stranding partners across two states, including The Marine Mammal Center, PAWS – Progressive Animal Welfare Society, NOAA Fisheries, the Washington Department of Fish and Wildlife, and the U.S. Coast Guard. Leo was released near the location of his original rescue in Ocean Shores, Washington. Researchers at the Center attached a satellite tracking device to the fur on his head, allowing scientists to collect data on his behavior in the wild. Leo the Steller sea lion plays with kelp at The Marine Mammal Center. At 7 months old, Steller sea lion Leo already weighs more than 200 pounds—and he’s gained more than half of that since his rescue three months ago. But despite being bigger than most of the patients on-site at the Center right now, Leo is still just a pup. In the wild, he would be with his mother learning how to be a grown-up Steller sea lion. During his long-term rehabilitation stay at The Marine Mammal Center, our animal husbandry experts are working hard to ensure that Leo develops the skills he’ll need to succeed in the wild. They enrich his daily routine by giving him opportunities to catch live fish, play with kelp fronds or solve puzzles like how to reach herring frozen inside of a large block of ice. Because Steller sea lions are a social species and often interact with other species in the wild, Leo’s social development is important too. While at the Center, he’s been able to socialize with northern fur seals and California sea lions of all ages. Watch as Leo is introduced to some new friends, greeting them by touching noses to get a sense of each others’ smells. Then watch what happens and see if you can figure out who’s in charge. All four of Leo’s current pen-mates are California sea lions. The three smaller animals are Rocky and Chilly, both pups about the same age as Leo, and Nilla Ice, who is a year older. All three were suffering from malnutrition when they arrived at the Center but have since been eating well and put on weight. They each weigh 50-70 pounds. Bubbly, a male juvenile, is the largest of the sea lions living with Leo, weighing in at more than 80 pounds. He was entangled in fishing nets when he was rescued and still has visible scars around his neck. Based on the wear on his teeth, our veterinary experts estimate that he’s about four years old, making him the most mature animal in the pen—and, quite clearly, the boss! When interacting with Leo, Bubbly establishes the social order by repeatedly vocalizing at Leo, who complies by jumping back in the pool. Leo the Steller sea lion at The Marine Mammal Center. At approximately 8:30 a.m. on November 13, Coast Guard Commander Dan Bishop of Air Station Sacramento gathered his crew and passengers aboard a C-130 aircraft to brief them before their flight to Seattle. “Today we’re on a mission to be proud of,” he began. He was surrounded by men in green flight suits, representatives from the Coast Guard Living Marine Resources Division and staff from The Marine Mammal Center, including Veterinarian Dr. Cara Field and Veterinary Technician Lauren Campbell. Two of the Coast Guardsmen involved in the mission were former volunteers at the Center: Lieutenant Shannon Anthony, 11th Coast Guard District, had recently been part of an animal care crew on Mondays. And Ron Clark, a retiree who volunteers with the U.S. Coast Guard Auxiliary, said he had helped care for animals at the Center nearly three decades ago. The rescue team listened as Commander Bishop told them what to expect: They’d be keeping the cabin cool and flying at a lower altitude in order to keep the cabin pressure at an appropriate level. It would also be very loud, he said, checking to make sure everyone had grabbed ear plugs on the way in. He pointed out the circular hatch above them and the rope ladder leading them to safety in case of emergency. He left the rest to Dr. Field, who gave the team some background on the cargo they’d be picking up in Seattle: a five-month-old Steller sea lion pup named Leo (Latin for “lion” and appropriate given the thick mane of fur he’ll develop as an adult male). Leo had been found stranded without his mother on a beach in Ocean Shores, Washington. He was emaciated, had several wounds and was much too young to care for himself, so he had been brought to PAWS Wildlife Center in Lynnwood, Washington, for temporary care. Knowing the orphaned pup would need long-term rehabilitation and other animals to socialize with, NOAA (the federal agency that manages marine mammal stranding response) worked with the U.S. Coast Guard to arrange for transport from Washington state to The Marine Mammal Center in Sausalito, California. The Center's veterinary team and the sea lion pup were able to hitch a ride on a training flight that had already been scheduled that day. Although he was still young, Leo already weighed about 100 pounds, Dr. Field said, and he would be transported in a large crate that would need to be strapped down. “Do we have our seal straps?” Commander Bishop asked jokingly as the crew began to ready the aircraft for take-off, including securing a cabinet full of straps of all sizes. Prepared for many different types of missions, the Coast Guard crews at Air Station Sacramento often carry cargo such as supplies needed for search-and-rescue efforts out at sea and illegal substances, like cocaine and marijuana, seized during on-the-water raids. Once the plane landed at Clay Lacey Aviation in Seattle, the doors were opened to a waiting crowd including the team from PAWS, representatives from NOAA and reporters from every local TV news station. After some brief introductions and a patient update, the team moved quickly to load Leo’s crate into the back of the aircraft. A group photo taken just before heading back to Sacramento offered a small snapshot of just how many people were involved in saving this orphaned pup. It was a sentiment that seemed to resonate with the entire crew, as each person aboard the flight took a few moments to stop and peer into Leo’s crate while moving through the cabin. Leo did his part to make himself known as well, living up to his name by belting out a roar every now and then. About two hours after leaving Seattle, the plane arrived back at Air Station Sacramento, greeted by a crowd of well-wishers and TV reporters. As The Marine Mammal Center team loaded Leo onto the Center’s rescue truck, Clark reminisced about what it had been like volunteering at the Center more than 25 years ago. He said he and his daughter had cared for animals in bathtubs lined up next to each other. Seeing Leo’s transport on the flight itinerary that day, Clark had jumped at the chance to be part of the Center’s mission once again. “I didn’t realize how much I missed it,” he said. One of the old bathtubs that were used to hold animals in the early days of the Center. Leo’s long day of travel was nearing an end as the Center’s truck pulled away from the air base and started the drive to Sausalito. After reaching the Center, he was welcomed once again by a small crowd—this time a group of staff and volunteers ready to get him set up at his new temporary home. After checking his weight, the team brought his crate to a pen away from public view—an area where Leo could adjust to his new surroundings without risk of habituation to people. Once out of his crate, Leo explored his pen and made his way up the ramp to the pool’s edge. He seemed to stare at his reflection for a moment before touching his snout to the water and then diving in for a long swim. Leo is eating a lot and rapidly gaining weight during his stay at the Center. Thanks to the staff at PAWS, Leo had been eating well since his rescue in early October. Though a pup his age would normally still be with its mother nursing, Leo adapted quickly to eating whole fish, and he continues to gain weight, just as a growing Steller sea lion pup should. Now five weeks into his rehabilitation, Leo weighs 164 pounds, though he’s still just a fraction of his adult size. By the time Leo reaches adulthood in another eight years, he could weigh 2,500 pounds. Leo is now sharing an enclosure with several northern fur seals. Though Kadiddlehopper, Barrell, Fructus and Rai Hope are small, weighing about 28 pounds each, they are feisty and playful—and keep Leo busy. He’ll remain at The Marine Mammal Center until he’s strong enough to survive on his own in the wild and can be reunited with other Steller sea lions his age. Help provide the critical care that marine mammal patients like Leo need to be successfully returned to their ocean home. Your support goes a long way to help these animals get a second chance at life. Find out more about marine mammals. Get updates about our patients and follow their fascinating stories. Sign up for updates from The Marine Mammal Center. Learn how you can: Get Involved to Help Marine Mammals! 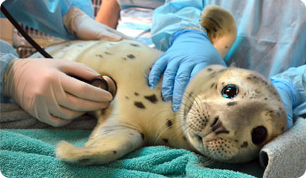 Patients at The Marine Mammal Center have some amazing success stories! Read their seal and sea lion sagas!